A six hour rain delay ground into both the Seattle and Baltimore pitching staffs as evidenced by shaky pitching by M’s starter JA Happ, and Orioles’ Chris Tillman, and Brian Matusz. Normally reliable JA Happ, was shelled for four runs in the first inning, giving up a grand slam to Steve Pierce. Clearly showing that he didn’t have the stuff needed today, Happ was removed from the game early. An outlandish 13 men left on base totals by Seattle, plagued the Mariners bats. The offense however, plugged away getting production from the unlikeliest of places: the bottom of the order. The new Mariners catcher Wellington Castillo , hit a sacrifice fly in 2nd inning to score Nelson Cruz. Later on, Castillo got on base and scored on a Rickie Weeks 2 run RBI. A bases loaded walk by Logan Morrison in the 7th, scored Brad Miller, to tie the score. Unfortunately, for the Mariners, the bullpen could not hold pieces together as a beleaguered Danny Farquhar, came in and gave up an RBI single to J.J Hardy in the 8th for the game winning run. 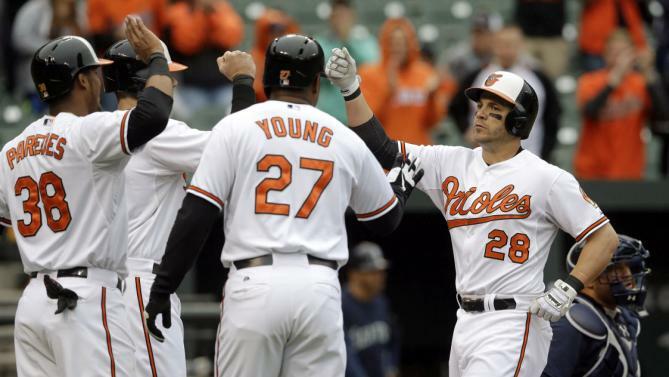 Orioles 2nd baseman Steve Pearce launched a 365 ft blast with bases loaded to score the home team’s first 4 runs.